All-Nepal Asteroid Search Campaign (ANASC) is a hands-on astronomy program for high school and university students with a unique opportunity to make original discoveries of asteroids. It provides high-quality data to the students to get the taste of astronomical research and discoveries. Prior to each search campaign, two-day workshop is organized in order to familiarize students in a campaign for their successful discoveries! Team Registration has been extended until April 25, 2019! For registration Click here or call us at 9843708248. 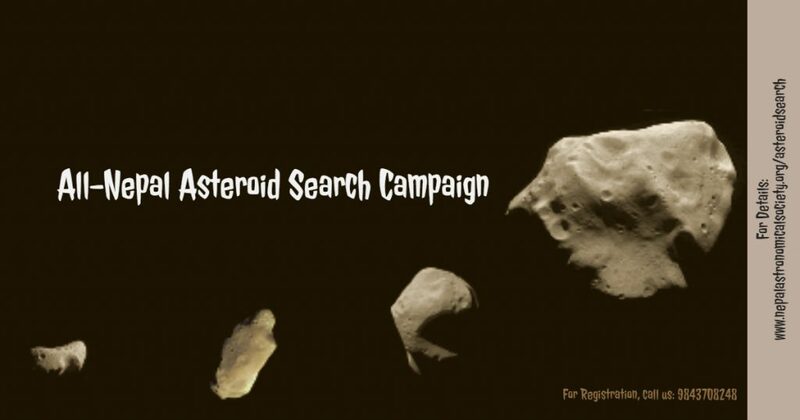 Anyone who wants to have hands-on experience to make original discoveries searching asteroid from world-class telescopes can participate in the program. Priorities will be given to high school students but university students can equally apply for the program. Interested students/school/college can contact us at 977-9843708248 for registration details. Each team can have a max. of five participants. Effective search teams are those teams which have team members from the same classes. Is there any limitation for the team registration for a school/college? We don’t have a restriction on team registration from a school/college at the moment. As we are looking for enthusiasts/hardworking and passionate students who are looking for an opportunity to get original astronomical discoveries during their school/college, we may register more than one team from a school/college. When are the next campaigns? The campaign runs several times a year. Due to a technical limitation, we provide take only thirty teams each time. For a full list of campaigns, please contact our office. The participating team must have access to computer/laptop (operating system: Windows 7 or 10 only) with good internet connection (at least 512kbps or preferably 1Mbps or above).